There is general consensus regarding threshold levels that describe the gray zone on the limits of viability, and gestational age alone should not be used solely in making a decision. 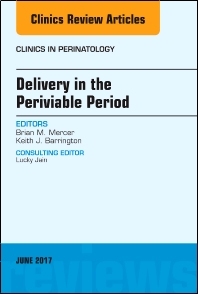 This issue will bring light to the latest thoughts and clinical recommendations for delivery during the periviable period. Top thought leaders and clinicians have submitted articles in the following areas: Consequences of Birth at Periviable Gestions on Organ Systems; Medical and Surgical Interventions Before Birth; NICU Care: Nutrition/NEC; Pulmonary Care and Circulatory Support; NICU Stay and Microbiome; and Ethical Considerations and Counseling, to name a few. Readers will come away with the most current content written on this topic and details that can be incorporated into clinical care.